Blockchain is easily becoming the future of computing. Driving a campaign of decentralization, blockchain offers people empowerment as it breaks away from third-party institutions. With the wave of developing different solutions riding on the blockchain technology, Paycent aims to be the differentiating factor in bringing in a useful solution to everyday financial roadblocks. After the recent success of the ICO campaign and Paycent Cards pre-registration, Paycent is proud to announce its official launch of its Paycent Hybrid App on App Store and Play Store. 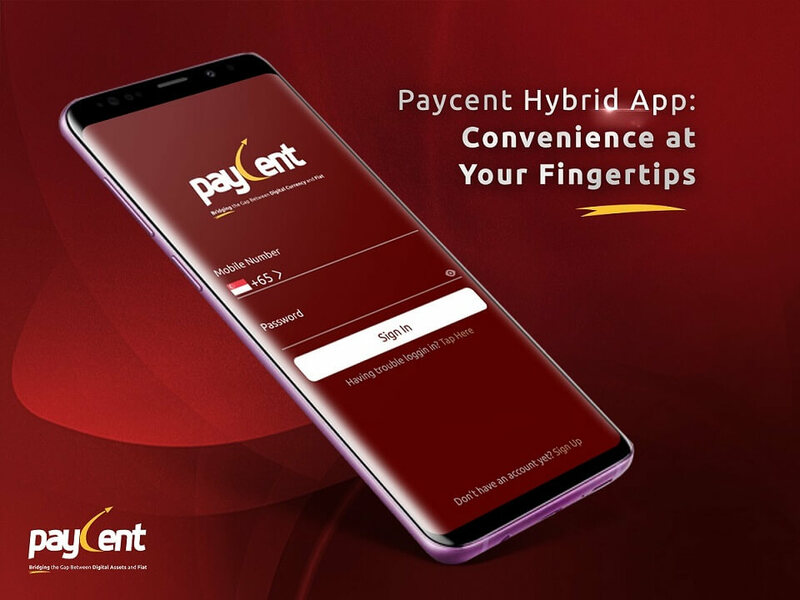 Following its roadmap, Paycent, a financial platform powered by Singapore-based Texcent, has made it possible to empower the unbanked sector and bridge the gap between digital assets and fiat. Paycent is a game changer as it allows you to manage, transfer, and pay using multiple digital assets through your smartphone or the physical Paycent Card! The Paycent Hybrid App is packed with features that will help everyone with their requirements in financial services. Alongside the feature-packed app is the Paycent Card that could be ordered within the application. Easily Cash In with SIP US (SIP US = 1 USD) using your credit or debit card or through bank via XFERS. You may also Cash Out your funds using your very own Paycent Card. Rest assured that your funds stored in the app is secure as we follow the highest level of standards in the industry. Paycent is available in different countries where you can send, request, and receive funds with ease. You can use the Paycent Hybrid App for your digital assets such as Ether, Bitcoin, and Litecoin. Through the Paycent Hybrid App, you may order a Paycent Ruby card which enables you to spend your funds across 200 countries including China, Pakistan, Nigeria, Slovenia, and Namibia. With the Paycent Hybrid App, experience real-time conversion of your various digital assets with just a few taps. Paycent aims to make every conversion go smoothly and secure. You can cash in a certain amount and convert easily without having to worry on how long it takes. Download it now on Google Play! Together, we will bridge the gap between digital assets and fiat. Paycent has partnered with Dash!